We reported on Friday of the allegations contained in the BBC Newsnight investigation concerning alleged fixing of Olympic bouts to ensure 2 Gold medals for Azerbaijan . The sport’s ruling body, the AIBA has now responded and here we include their full response. The initial enquiries will be made during the 2011 World championships which start in Baku, Azerbaijan this weekend. “The President of AIBA, Dr Ching-Kuo Wu has announced the establishment of the AIBA Special Investigation Committee to investigate allegations made on BBC Newsnight. While this exemplifies AIBA’s zero tolerance attitude to corruption and absolute commitment to ensuring transparency in the sport of boxing, at this stage AIBA is not aware of any credible evidence to suggest that the allegation that WSB’s Chief Operating Officer, Mr Ivan Khodabakhsh, promised the award of two gold medals in return for payment is true. Ivan Khodabakhsh is a man of integrity and AIBA trusts him and respects his work. Mr. Khodabakhsh has confirmed to AIBA that he will cooperate fully and freely with the AIBA Special Investigation Committee. In 2010 an agreement was signed between WSB SA, a Swiss incorporated company which runs the World Series of Boxing competition under the auspices of the AIBA, and a Swiss company for a loan in respect of the operation of WSB’s American franchises. The Swiss company facilitated the making of the loan, which originated from an Azerbaijani private investor. The loan was not “secret” and nor was there anything improper about it. It was an arms length transaction between two entities made on a commercial basis and with a view to a commercial return for the investor. While that investor prefers not to be named, as is their right under the terms of the agreement, AIBA/WSB can confirm that it is a private investor and is NOT the Azerbaijani Government (whether a ministry or any other arm of the government) or the Azerbaijani Boxing Federation and that none of the funds were derived from the Azerbaijani Government. Any suggestion that the loan was made in return for promises of gold medals at the 2012 Olympics is, we repeat, preposterous and utterly untrue. AIBA/WSB believe that such allegations have been made by individuals with an axe to grind, who are totally discredited. As well as unjustifiably imputing corruption to AIBA/WSB, they demonstrate a complete misunderstanding of the procedures which now lead to the award of Olympic boxing medals and the impossibility of influencing these. “The allegations that have been made against WSB and me are all completely groundless and false. I have never been asked to nor have I ever undertaken anything illegal or unethical in the course of my duties working for WSB. I am proud to work for an organisation which has brought such a high level of transparency and honesty to the sport of boxing and has shown zero tolerance of corruption. I adhere to these values. The BBC programme included interviews with several individuals. One interviewee, Jeffrey Benz, is a former manager of a WSB Franchise in the United States, whose contract with WSB was terminated after less than three months. The programme also contained an interview with Rudel Obreja. Mr. Obreja is currently serving a five year suspension from AIBA for serious breaches of the AIBA Disciplinary Code, information that was not shared by the BBC. Two individuals, who made very serious allegations in the programme, refused to reveal their identity on camera, giving no opportunity to test their credibility. If such individuals are not prepared to publicly stand behind their allegations, such allegations cannot be regarded as either sound or credible. The AIBA Special Investigation Committee will start its work by asking the BBC to send them all the material on which they relied for the purposes of their programme, and they note that the IOC President, Jacques Rogge, has also called for this, which they welcome. 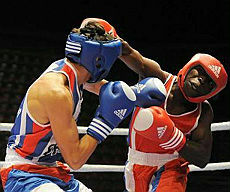 While the report made several references to the award of a gold medal to a South Korean boxer in suspicious circumstances at the 1988 Olympics it completely failed to make clear that a new and wholly different and transparent scoring system has been introduced and will be used at the upcoming World Boxing Championships and the London 2012 Olympic Games to ensure fair play at all times. This includes publicly displaying each individual judge’s scoring immediately after each round is completed. Had this been the case in Seoul in 1988, manipulation by a judge or judges would have immediately been apparent. With the approval of the AIBA Executive Committee, the AIBA President has immediately launched the AIBA Special Investigation Committee made up of the individuals listed below to examine the allegations. “”We welcome AIBA’s announcement of an immediate enquiry into these claims and we await the outcome of their investigation,” said the IOC Director of Communications Mark Adams. “For its part the IOC takes all allegations of corruption very seriously and we would urge the BBC to make any evidence they have available to AIBA and to our Ethics Commission which will then determine if further action is necessary.